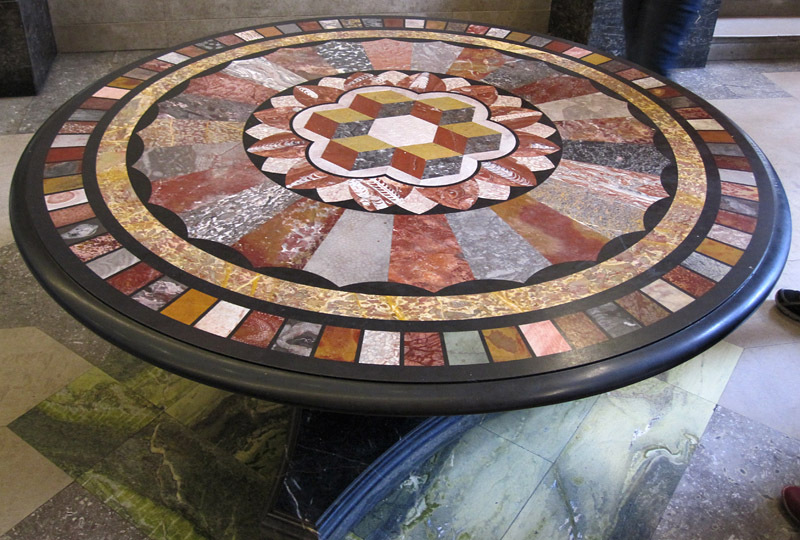 Wandering through the Earth galleries at the Natural History Museum a few years ago, I came upon this splendid marble table. 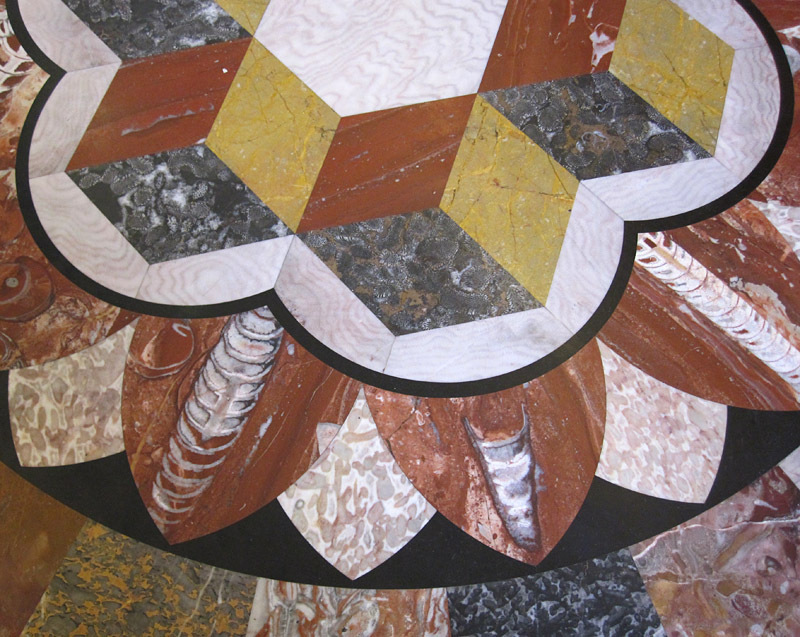 The intricate inlay work highlights a range of mid-Paleozoic fossils: cephalopods, corals, algae, and stromatoporoid sponges, enclosed in variously coloured veined and brecciated limestones. Although I took many photos of the table (far more than shown here), I foolishly did not look to see if there was any signage explaining it, and I have not been able to find any proper explanation online. The most I can glean is that the table may have been made relatively recently, and that the limestones may all be from the Devonian of south Devon. If you know more about the source, please share this information with a comment! The orthoconic cephalopods all have their apertures pointing toward the table’s axis. That is so incredibly beautiful! … the colors, the patterns, the intricacies … wow. Yes, I thought it was worth putting out there, since there was surprisingly little I could find about it on the web. There is a shop in down town Naples, Italy, that will make you a coffee table using patterns similar to those shown here. That beautiful work one sees in the Italian cathedrals is still being done as well as being repaired by the few craftsman still doing the work. hi, this kind of table could well have bedn made in devon by local craftsmen in the 19th c. Torquay museum had an exhibition last year and may help with identifying. 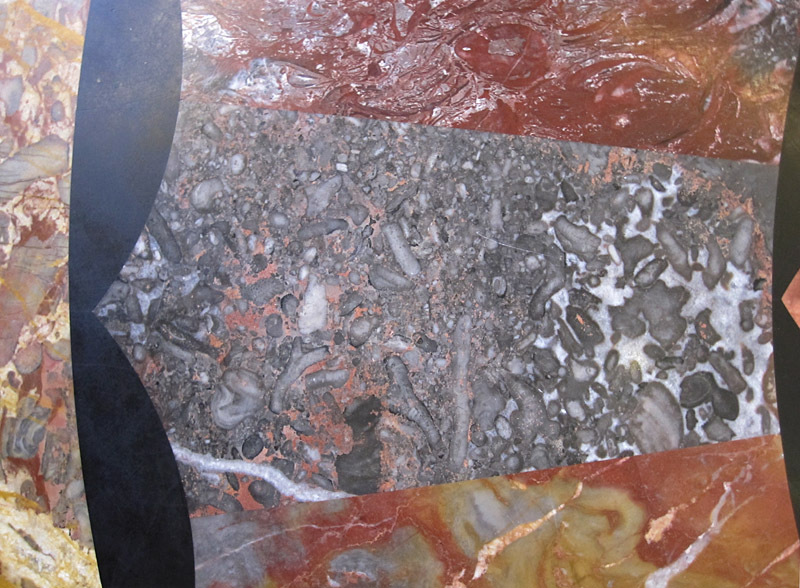 i do this type of work too..there are some lovely marbles and limestones in devon and the u.k. it’s great cutting a stone and revealing the beauty inside! some names of stone here are ‘petit-tor’ ashburton, plymouth and stoneycombe. Matt, thank you for the information. Is any of your work posted on the web? 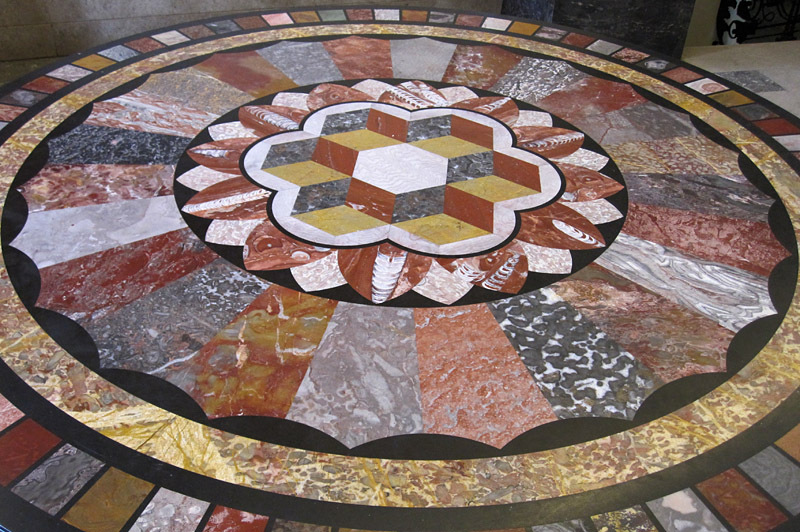 I do a lot of marble floor work and once in a while a client will come in and want a custom table, so I’m always looking for fresh inspiration and design ideas. My guys love a project like this one here. Customers are generally a little shocked at the price, but I tell them “you’re commissioning a piece of art” and that makes since to them. A person doesn’t realize up front how many hours will go into a piece like this. The level of detail looks pretty intricate on this particular piece. Thanks for sharing Graham! Thank you for your comment. I will take a look at your website to see what your work looks like!